When I left off yesterday, I just finished discussing the basics of setting up Neutron on a single-server OpenStack deployment. I set up a flat network – external – and mapped it to my external bridge – br-ex. 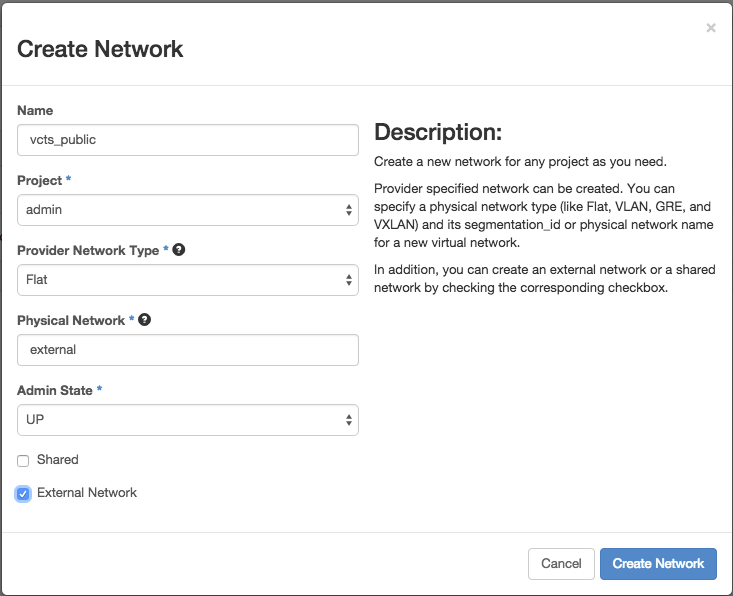 I am now going to discuss how to set up an external network for use by OpenStack tenants. Note that these are not usually used directly, but are taken by tenants as floating IP addresses, that are NATed from specific hosts in tenant networks. How floating IP addresses are specifically allocated will be discussed in a later article when I start to launch instances. There’s only a few things to consider here. Remember that the general best practice for OpenStack right now assumes that external traffic is sent to a router that is independent of the OpenStack deployment. IP space is fully managed and routed by the cloud administrator and realistically a full range will be available to assign to the external network, which can then be given out as floating IPs. IP space is managed by a hosting provider that provides services to the cloud administrator, and a specific, probably smaller, range will be able to be assigned to the external network. In both of these scenarios the setup is the same, the only thing that is really different is how the traffic is handled after it leaves the cloud, which is out of the scope of this article. 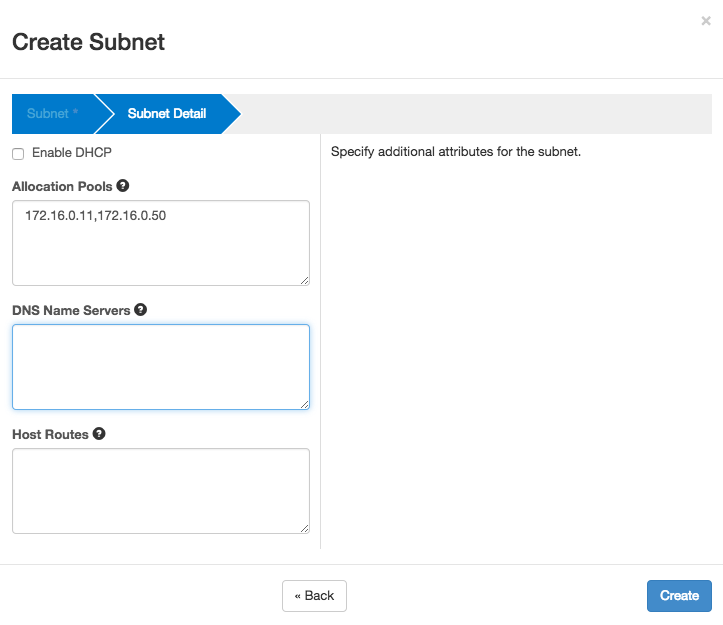 If a development server is being set up, on the other hand, sometimes other considerations need to be taken into account, such as any existing DHCP ranges that will affect the range that I give to OpenStack. Generally, the low addresses (less than or possibly equal to 10) are reserved for network devices. Say this is an existing network as well with a DHCP range of 172.16.0.100-172.16.0.199, which cannot be encroached on. I need a significant range of addresses for floating IP addresses, and router IPs for tenant networks. Based off of this, 172.16.0.11-172.16.0.50 may be a good start. This can be done in both the CLI and also the web interface. The manuals discuss how to do it in the CLI (see here), but I will discuss the web interface, as it is perfectly capable of doing everything that the CLI can do for this task. Make sure the admin project owns this network as it is crucial for routing. Mark the network as external, and ensure the physical network reads external as well as this is the physical network that was mapped to the external bridge in the Neutron configuration. If another flat network name was chosen for the mapping, use that name. Admin state should be up, unless you need it disabled at creation time for admin purposes. Note that DHCP is not enabled. This is not needed for external networks and is generally kept off. Otherwise, the rest of the setup is pretty straightforward. One thing to note is how the ranges are entered: ranges are entered on separate lines, with a comma separating the first and the last IP in the range. Name servers and host routes are generally entered on the tenant network, as those settings are added to instances. 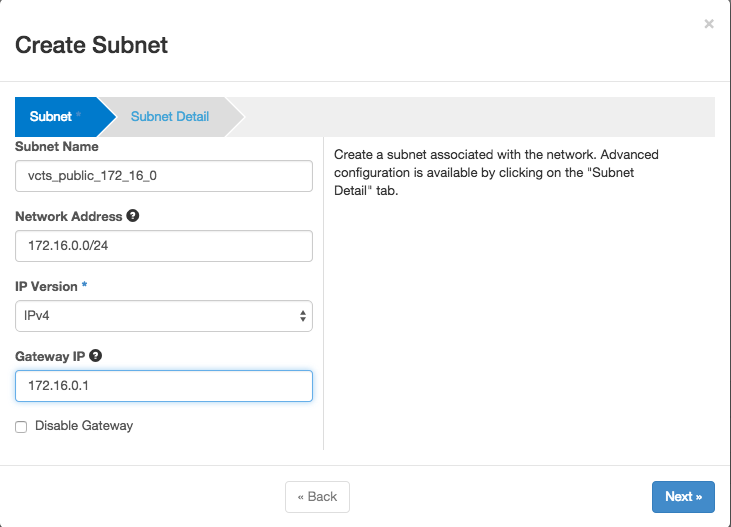 After the subnet is created, network deployment can proceed to creation of the internal network.